There are a few ways to get wireless working on your RPi, but as far as I can work out, this is the easiest. This tutorial is prepared for Raspbian distro, but will also work on most Linux distributions. The tool works in desktop environment as well as on a headless machine. What I'm going to show is how to install wicd, a wireless daemon that runs on your system and provides easy wireless configuration. Open a terminal window on your Raspbian, or access the machine with console cable (it is not recommended to install **wicd **using ssh, as you may loose connection at some point). If you can get a temporary wired internet connection to the machine, you can grab the packages from the repositories. This is the easiest way to install wicd and the following line will install all the required packages in one go. Note: when prompted if you want to add any users to the netdev group, add your local user account (this is the one you specified during installation). If you got any errors saying that wicd couldn't start then you've probably got network-manager installed. Otherwise, skip this section. Amend /etc/network/interfaces to contain only the following: ``` # The loopback network interface auto lo iface lo inet loopback ``` **Note:** as of wheezy it is fine to have your wireless interface in /etc/network/interfaces (it might even be required, not sure). Start wicd-curses and configure your wireless network (if that's what you need) to make sure that everything is in working order and you can live without network-manager. From here on it's pretty simple. You should get a basic interface with a list of networks your wireless adapter can 'see'. 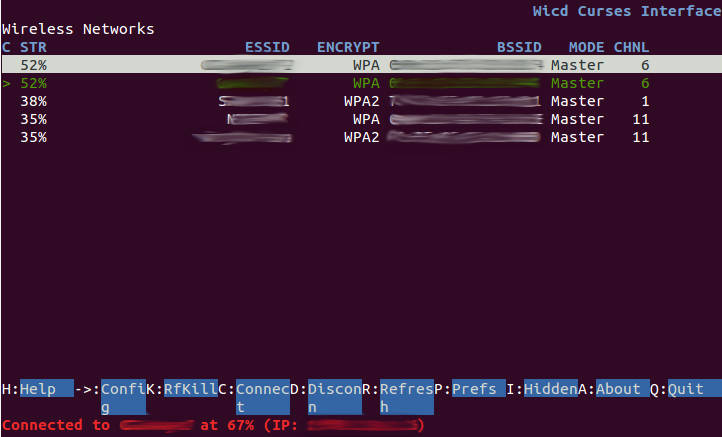 To enable wireless interface wlan0, you can either sudo nano /etc/wicd/manager-settings.conf and set wireless_interface = wlan0, or from within the wicd menu hit p key and set it there. Congratulations, you now have wireless networking!